Augeron Horses were developed in Pays d’Auge ( an area in Normandy France). They are also known Caen or Virois horses and they were developed from the Percheron breed sometime around the 19th century. In 1904, Augeron horses were sold in Argences and Bayeux of Lower Normandy. People bought them for their homogeneity, beauty and high value. 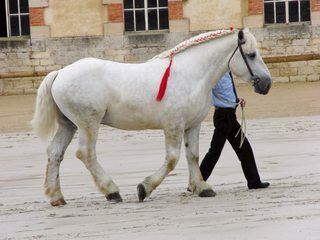 The Société hippique du trait augeron, or Augeron Horse Society, was formed in 1913 by breeders in Auge to record these horses in a breed registry. The society wanted to preserve the breed and make it distinct from its ancestors, the Percheron. They are light gray; tall, strong, well-built; and energetic. They are 158–170 cm (15.2–16.3 hands) tall.